When FX Networks CEO John Landgraf sealed the deal last November to secure exclusive cable, VOD and non-linear rights to The Simpsons for his fledgling cable network FXX, he was elated ("It's arguably one of the greatest shows ever made! ")—but terrified. "I was really nervous about it. If it hadn't worked, it would have been a financial drain on the company's competitive abilities and resources for the better part of a decade…. There was a lot of sticker shock associated with the price we paid," said Landgraf, who shelled out an estimated $750 million for the long-term deal. Plus, given that The Simpsons was in its 25th season at the time, "there was no way to calculate how many times people had already watched. There was no way to calculate the nostalgia factor for people that might have fallen off the Simpsons train. And, by the way, we chose to put it on a channel that didn't exist, essentially." That would be FXX, the former Fox Soccer network, which relaunched Sept. 2, 2013 as FX's younger, edgier sibling. But early on, even Landgraf seemed unsure of what defined an FX series versus one that aired on FXX. By Nov. 13—almost exactly a year ago—things seemed bleak for FXX's future when the network canceled its late-night talk show, Totally Biased With W. Kamau Bell, which was drawing as few as 10,000 total viewers per night after relocating from FX. That all changed two days later, when FX Networks announced its Simpsons coup and made FXX relevant, and essential, almost overnight. Excitement over the impending Simpsons arrival helped drive prime-time ratings for the network—it had ranked 93rd in adults ages 18 to 49 when FXX took over Fox Sports and shot up to 45th as The Simpsons debuted with a mega-marathon. 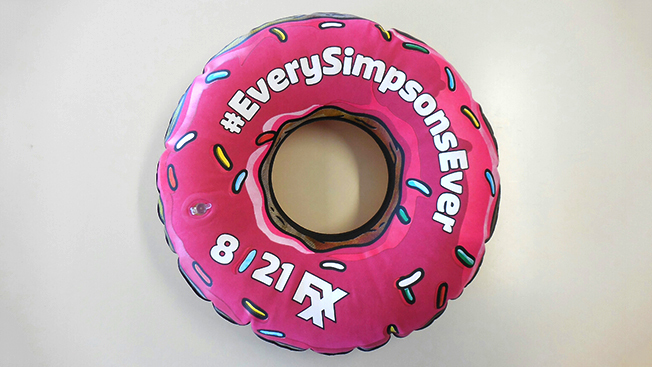 That event, which lasted Aug. 21 through Sept. 1 and included all 552 episodes of The Simpsons (and The Simpsons Movie) in chronological order, was a rousing success, catapulting FXX all the way to cable's No. 1 network in adults 18-49 during prime time for the duration of the marathon. Since then, regular syndicated episodes of The Simpsons (as well as themed mini-marathons like last month's 12-hour Treehouse of Horror event) have kept viewers hooked. FXX ranked 27th in 18-49 viewers during prime time in October, a stunning resurgence for a channel that seemed on the verge of irrelevance just one year earlier. Not even Landgraf had dared to dream that his near-billion-dollar investment would pay off so quickly. "There's literally no entertainment channel in the history of cable television that's done anything like it," said Landgraf, noting that FXX is still only in 75 million U.S. homes, compared to the 95 million homes that FX, and many of its other competitors, occupy. Thanks to The Simpsons, "FXX is essentially outperforming…and it will be adding 15 of those 20 million over the next two to three years. So I still believe there's a considerable amount of upside where The Simpsons will ultimately land." Will Viewers Stay for Original Shows? Now, his challenge is to convince the Simpsons audience to stick around for FXX's originals, like a new comedy debuting next year, Man Seeking Woman, as well as a second season of the low-rated yet brilliant You're the Worst, which will be moving over from FX. Landgraf said "the coup de grâce" for FXX was landing the entire Simpsons syndication package, even though Twentieth Century Fox Television had talked about possibly splitting it in half, or even thirds, among the bidders. "What we said is, no. The only way we want this is exclusively. We want to be able to be the librarians who curate them. We don't want it on subscription video on demand. And we want to be able to offer all the episodes in a non-linear environment on advertising video on demand, meaning on our own partner sites. Because we think, as much as we can do with the shows linearly, we can actually do more non-linearly." Ultimately, Chuck Saftler, president of program strategy and COO of FX Networks, who negotiated the deal, landed exactly that. "Also, we're versioning, so you have essentially a bare-bones version of Simpsons World," said Landgraf, adding that upcoming features include the ability to search every word of dialogue from every episode, and to share favorite quotes and clips via social media. "So it's not only getting through all the authentication pathways, it's getting it on every major device and then ultimately rolling out the full-bells-and-whistles creative and technological update, that will happen after the first of the year. The other thing is we're not even aggressively marketing it, because we figured, while we're still in beta and we don't have an authentication pathway for 40 million subs, we're just going to irritate people. So towards the end of the first quarter of next year, the beginning of the second quarter, we'll also begin to market it really aggressively on our air and in other places. I look at this as at least a two-year process. Essentially, we're less than a month into a two-year process." One of the sole complaints from Simpsons fans during August's marathon was regarding FXX's decision to crop the original aspect ratios of the early, pre-HD episodes to fit current widescreen televisions, which removed some of the visual jokes. Landgraf said that will be addressed in a future Simpsons World update—"You'll be able to get every episode in its original aspect ratio. It's been part of our development plan from the beginning; it just wasn't something we could include in Version 1"—but the episodes will remain unchanged (i.e. cropped) during their FXX airings. And while the "Every. Simpsons. Ever." marathon was a gargantuan success in sending FXX on its way, don't look for the network to repeat that stunt to goose ratings down the road. "We only had the right do it one time," said Landgraf, who credited Saftler with the idea. "He felt, quite rightly, that it would be a national treasure and an event that would galvanize people and get people talking. And so it was best used as a marketing kickoff. We can do marathons, but we can't do a marathon of that magnitude again." D'oh!